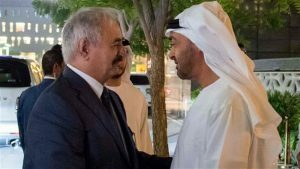 US officials have opposed plans by the United Arab Emirates (UAE) to woo UN-backed unity government’s military support, the Misrata-based powerful militia, which largely protect the weak UN-backed Government of National Accord (GNA) in Tripoli and which is opposed to Abu Dhabi’s protégé, Khalifa Haftar, London-based media The New Arab reveals. A meeting between Haftar, who heads the east-based Libyan National Army, and leaders of the militia was cancelled after Washington opposed the meeting, which, if held, could bring leaders of the militia to back Haftar and lead to the collapse of the GNA. The New Arab citing an unidentified source within Haftar’s camp indicates that the meeting set to take place early this month in the UAE was to bring together Haftar, Mohammad al-Haddad, close to the GNA’s leader Faiez Serraj, who recently appointed him as chief of the “central military zone”, and heads of the powerful Halbus Brigade. “The meeting – which was arranged by Abu Dhabi’s Crown Prince Mohammed bin Zayed – would have touched on ways to reconcile Hafar with Misrata militias and attempted to convince the militias to accept Haftar in the position of military commander,” the source is quoted as saying. The source reportedly added that the UAE has been working to persuade the powerful militias, which mostly back the GNA, to form a coalition with Haftar’s self-proclaimed Libyan National Army. The meeting could not go ahead after US diplomats got wind of it and feared that Haftar may overran Tripoli after conquering Benghazi, which he declared liberated from extremists early this month. “The diplomats did not give clear reasons for their opposition to the meeting but they spoke about the importance of political agreement instead of a military solution. One US official asked the UAE to promise that drawn out ‘Benghazi-like scenario’ wouldn’t happen in Tripoli,” the source told the media. Haftar recently and discretely revealed his intention to capture Tripoli, which he said was awash with extremist groups. The Misrata-based militia is essential for the GNA’s survival as it is the pillar of its military support. The GNA last year flashed out Islamic State group (IS) militants from Sirte thanks to the militia grouped under the banner of al-Bunyan al-Marsus. The militia has been opposed to Haftar, fearing he would impose military rule over Libya after the Libyans in 2011 got rid of Col. Muammar Gaddafi who ruled the country for over four decades.